AN EVENT IN EVERY BOSTON LOCAL NEIGHBORHOOD... EVERYDAY! The reasons are simple. EVENTS DRAW CROWDS. 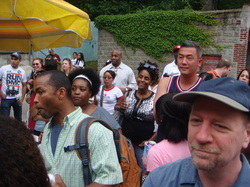 And wherever large crowds gather, you'll also find a large number of sales opportunities. You'll also find an even larger number of marketing and engagement opportunities. Unique opportunities such as these best explains a Boston local business's desire to sponsor such events. To be simply 'named', 'spot-lighted' or in any way officially associated with a Boston local neighborhood event, can actually 'draw' direct sales, marketing and branding opportunities their way. Even unofficial association can provide sales and branding opportunities as well. As event crowds gather and even disperses, indirect sales and marketing opportunities exists for Boston local neighborhood businesses located both within the specific Boston local host neighborhood and the surrounding Boston local neighborhoods. So any association or 'connection' with either the Boston local neighborhood event or the Boston local 'host' neighborhood can present indirect positive marketing and brand recognition opportunities. Over 90% of these Boston local event crowds are totally mobile-centric, actively-engaged, and socially-connected mobile users. Along with sponsorship, additional signage, and other preparations, what better way to connect and engage with the vast majority of Boston local event crowds than via the 100% mobile, local marketing and social engagement consumer environment of BOSTON LOCAL? With over 90% of your entire Boston local neighborhood customer and client base also actively mobile, what better way to simultaneously 'connect' with them 24x7 and associate with the Boston local neighborhood event than via the 100% whenever-wherever mobile environment of BOSTON LOCAL? 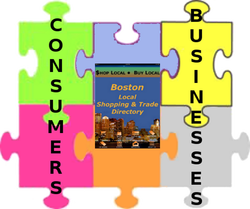 Through The Boston Directory, anyone, anywhere can subscribe to instantly receive push notifications of various City of Boston, Boston local neighborhood, and Boston local business events. With a simple "Yes" or "OK" selection, anyone anywhere can become a Boston local event subscriber receiving first-hand event news and information. These are some of the best people you'd want to know first about your event. Why? Both directly and through their social media 'connections', they'll spread your event news like wildfire. 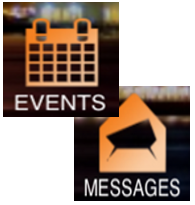 Should they miss your event news, and for everyone else, The Boston Directory 'Events' section contains every events message sent to subscribers presented in dated order. Grand Opening or Re-Opening, New Store/Office, BIG Sale, Galas or other major business event? A full-color, fully-branded push notification graphic announcement can be pushed to every business and consumer subscriber in either your neighborhood, citywide or globally. So no matter where they are, they'll get your message announcement. Should they somehow miss it, they'll conveniently find it in the "Messages Tab". Give your business event a real boost. Contact us for details.